The Seine river rises about thirty kilometres northwest of Dijon and passes through Paris on its 777-kilometre journey to the sea. Paris was founded on Île de la Cité, a small island in the Seine, and now has grown to the point that there are 37 bridges over the Seine within the city proper. As this map shows, the Seine's course is serpentine between Paris and the sea. The Seine is navigable by ocean-going ships as far upstream as Rouen, 120 kilometres from its mouth at Le Havre. Periodic dredging keeps it open for large ships. It only drops 24 meters over its last 446 kilometres, so its usual slow flow helps to keep it navigable. Atlantic salmon returned to the Seine in 2009, migrating upstream past Paris. Industrial and agricultural pollution plus the dams had driven salmon out of the Seine some time between the two World Wars. But now you can again catch salmon from the riverbank in Paris! Smaller commercial barges can go as far beyond Paris as Burgundy. With the modern dams and locks, the Seine has an average depth of about 9.5 metres where it passes through Paris today. The dams and locks start above Rouen, you can see one in my picture from Rolleboise. William the Conqueror became Duke of Normandy in 1035, and led the Norman Conquest of England in 1066. His forces were victorious at the Battle of Hastings on 14 October 1066, and he was crowned the first Norman King of England on Christmas day in 1066. William returned to Normandy around the end of 1086, and soon set up a marriage of his daughter to the Duke of Brittany in order to get more allies against the King of France in Paris. William led an expedition to the area of Mantes in July 1087, to take a little more territory including the town of Mantes. William either became ill or was injured during the fighting, it's not clear just what happened to him. He was taken back to Rouen where he died on 9 September 1087. 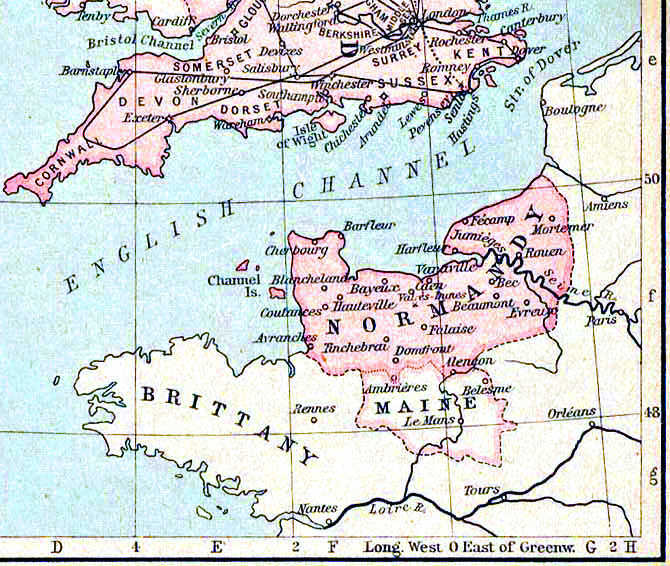 This map shows William's area of control in 1087 in pink. 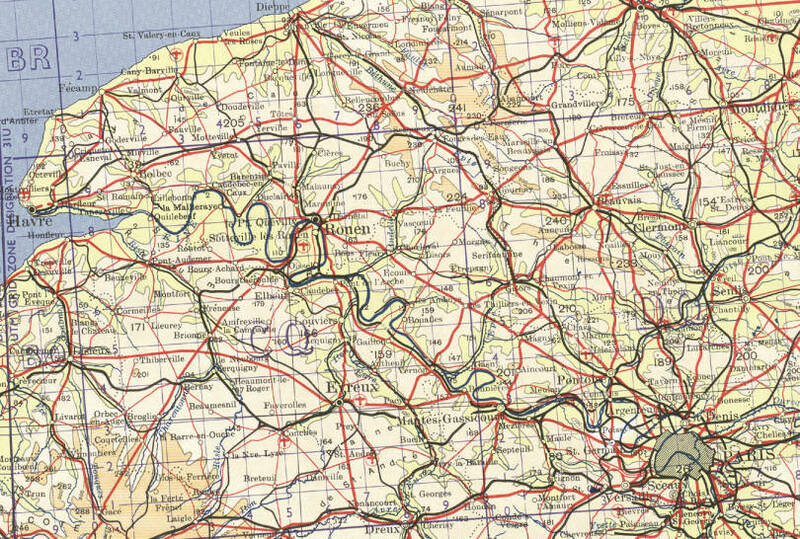 These pages start with the first loop just outside the Normandy line, by the letter "n" in "Seine". Continental holdings of William the Conqueror in 1087 in pink, original full map here. Mantes-la-Jolie is a commune or community of about 42,000 people. 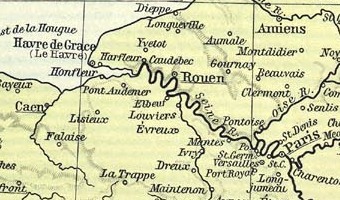 It used to be a large settlement mid-way between the power centers of the Kings of France in Paris and the Dukes of Normandy, originally actual Normans or Norsemen, at Rouen. Now it is more or less a far outer suburb of Paris. It has been known officially as Mantes-sur-Seine, then in 1930 it merged with the commune of Gassicourt and was called Mantes-Gassicourt, and then in 1953 it was renamed as Mantes-la-Jolie. Informally, and less confusingly, it's just Mantes. Let's zoom in, using the below map from 1951-1953 from the Perry-Castañeda Map Collection at the University of Texas at Austin. Mantes is at the bottom right, it was still officially Mantes-Gassicourt when this map was published. We will go around that first loop below Montes, through Rolleboise, Mousseseaux-sur-Seine, Lavacourt, and Vétheuil, where Claude Monet lived from the summer of 1878 until 1883. In April 1883, Monet was riding a train between Vernon and Gasny and noticed Giverny. He moved there the following month, and lived there until his death in 1926. Then we will continue to Haute-Isle and La Roche-Guyon. From there, we will continue down the north or right bank of the Seine to Les Andelys and Château Gaillard. We will end up in Rouen, where Monet worked in 1892 and 1893 on a series of paintings of the Rouen Cathedral in varying lighting at different times of the day and year. So as we go downstream, we will be following Monet's painting projects in time order. Let's get started. You can look at these in any order, but I suggest reading downstream. Start on the first loop of the Seine.